A Dubai-based company’s sale of a stake in the Port of Berbera in Somaliland to Ethiopia in March triggered a political standoff between Somalia and the UAE that led to the two countries cutting military ties. The severing of funding for the Somali National Army (SNA) and withdrawal of UAE trainers and equipment will have a serious impact on the SNA’s capacity to fight al-Shabaab and delay the withdrawal of the African Union Mission in Somalia (AMISOM) peacekeepers. Puntland and other regional states have continued to engage with the UAE separately as they receive funding and other benefits from the Gulf country, illustrating the weakness of Somali federalism as Mogadishu holds little leverage to force its constituent states to adhere to a unified policy. 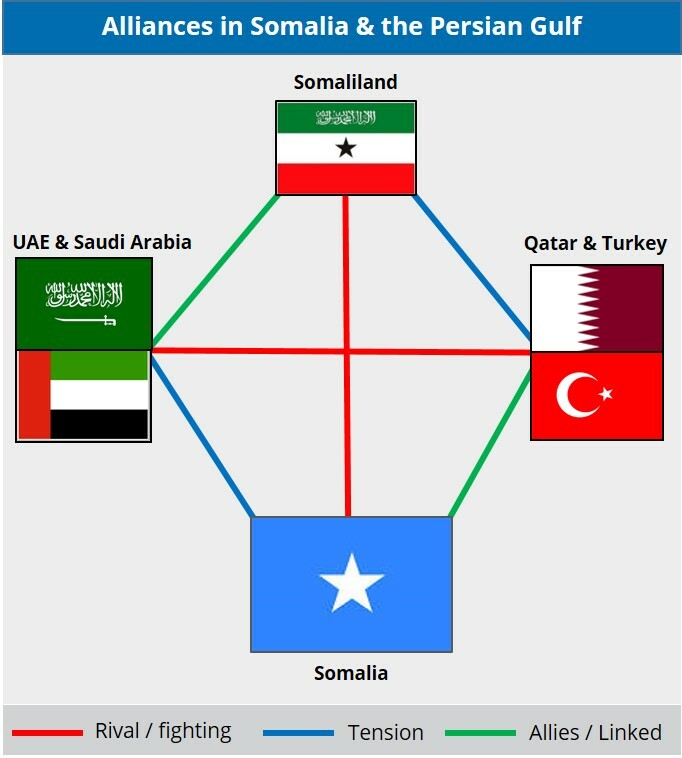 Turkey and Qatar are likely to increase their presence in Somalia following these events, though Mogadishu will likely attempt to restore ties with the UAE. Given Somalia’s dependence on the Gulf countries for support, Mogadishu will attempt to maintain its official neutrality toward the Gulf rivals even as its states pursue their own policies. We continue to advise against all travel to Somalia at this time with the exception of the Puntland and Somaliland regions. Travel within these regions should be restricted to cities and be for essential purposes only, while avoiding travel to outlying areas. On March 1, a Dubai-based company announced that it sold a 19 percent stake in the Port of Berbera in Somaliland, of which it is a majority owner, to Ethiopia. In response, on March 12, the Somali Parliament in Mogadishu declared the deal to be “null and void” as the federal government was not consulted prior to signing. Following weeks of turmoil and several military confrontations at the federal parliament, on April 8, Mogadishu airport authorities seized a private UAE aircraft and confiscated 9.6 million USD that was suspected to be directed toward several politicians involved. The Ministry of Defense announced on April 11 that it would cut all military ties with the UAE, with the Somali government to take over the duties of training, funding, and redistributing the forces that were under the UAE’s payroll. This prompted the UAE to withdraw its military trainers and equipment from Mogadishu on April 16, with some reports that their forces withdrew from Bosaso, Puntland as well. On April 21, Puntland President Abdiweli Mohamed Ali “Gaas” traveled to the UAE for talks with the government to secure continued support for Puntland’s maritime police forces. Likewise, on May 7, Jubaland President Ahmed Madobe visited Abu Dhabi, where he criticized Mogadishu’s actions regarding the UAE. Somali President Mohamed Abdullahi “Farmajo” traveled to Doha, Qatar on May 13 where he met with the Qatari emir and foreign minister to hold discussions regarding “joint cooperation” between the two countries. Over recent months, Somalia and the UAE have been engaged in a political standoff following the March 1 Somaliland port deal. Mogadishu does not regard Somaliland as an independent state while Hargeisa does not recognize Somalia’s authority, though a number of countries and companies have pursued separate tracks of political negotiations and commercial deals with Mogadishu and Hargeisa. In this context, the UAE has acknowledged Somaliland as a de facto country as it sought to develop political and economic interests across the region. Mogadishu’s decision to cut military ties with the UAE as a retaliatory measure after the port deal and related political turmoil is particularly notable given the UAE’s entrenched involvement. This includes UAE-based companies controlling, developing, and operating strategically-situated ports and infrastructure, while the government also funds humanitarian and development projects as well as individual Somali political figures, all in efforts to advance the Gulf country’s interests. One of the most significant developments was the UAE’s withdrawal of support to the Somali National Army (SNA). It is possible that Mogadishu did not fully consider the ramifications of severing its military ties but it came immediately, as the UAE withdrew its military trainers and halted financial support to 2,400 Somali soldiers, thought to constitute between a quarter to a fifth of the entire SNA. FORECAST: Somalia has recurrent difficulties raising enough revenue to pay its security forces and it is likely that they will be unable to cover those soldiers’ salaries after the UAE’s withdrawal, which could result in violent protests or incidents by unpaid soldiers. This potential was demonstrated in Mogadishu on April 23 when former UAE-backed soldiers looted their former base, clashing with other SNA troops, and went on to sell hundreds of stolen firearms on the black market. This illustrates not only the fragmented nature of Somalia’s security forces, often trained by different foreign powers and answering to different clan or regional interests, but the impact of these divisions and ill-discipline on maintaining security in the country. UAE-supported soldiers were thought to be among the best-trained and equipped forces in the capital, and these changes will only make it harder for security forces to manage the threat posed by al-Shabaab and other armed groups. FORECAST: This is also expected to impact the African Union Mission in Somalia’s (AMISOM) plans for withdrawal from the country. Peacekeepers have already begun to draw down, with plans to fully exit by 2020, though their departure is contingent on conditions that include improvements in Somalia’s security situation and political development, as well as the SNA’s ability to replace AMISOM. This further highlights the UAE’s multifaceted role in Somalia, as it contributes to building the SNA’s capacity, which has an effect on the broad security of the country and the army’s ability to step in for the peacekeepers, as well as their interference in Somali politics and institution-building. Given this role, should the standoff between Somalia and the UAE continue, this will complicate AMISOM’s plans. While this is positive in the short-term given AMISOM’s capabilities in comparison to the SNA, international donors have already grown impatient with continually funding the peacekeeping operation and this may force the end of the mission before Somalia is prepared to take over. In addition to Mogadishu and Somaliland, the UAE is also heavily involved in the semi-autonomous region of Puntland. There they signed a deal in April 2017 to develop and run the Port of Bosaso, alongside an agreement to create, fund, and train Puntland’s Maritime Police Force (PMPF). These financial and military benefits prompted Puntland’s president to publicly deviate from Mogadishu’s position and travel to Abu Dhabi in efforts to secure their continued support. His willingness to directly engage with a foreign government in defiance of the constitution that imbues only Mogadishu with the power to conduct foreign policy is another reflection of the limitations of Somali federalism and unification. FORECAST: Moreover, Mogadishu has little leverage over Puntland and would likely not be able to persuade the region to bend to their position. As a result, Puntland is likely to continue pursue its independent policies while Mogadishu softens its rhetoric in order to reduce the internal rifts. That the UAE would negotiate individually with Mogadishu, Puntland, and Somaliland is consistent with the longstanding conceptualization of Somalia into the three regions. 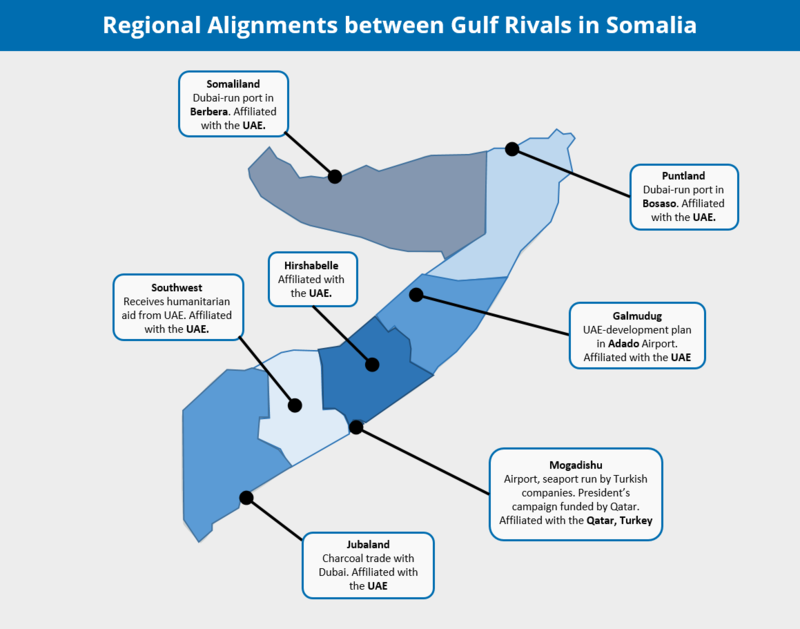 However, regional states in Somalia are likewise divided, and Jubaland, Galmudug, Hirshabelle, and Southwest states have all formed their own positions regarding the Gulf crisis and to which side they believe Somalia must be aligned. Much of this is derived from the funding Somali politicians receive from Saudi Arabia, the UAE, Qatar, and Turkey. While this has largely remained in the political sphere, one example of this manifesting in violence was the confrontation at the Somali parliament in April. This was, in part, driven by the parliament speaker’s opposition to the president and prime minister’s response to the Somaliland port deal, which he claimed was a result of their allegiances to Qatar. FORECAST: Given that both sides of the Gulf crisis continue to fund Somali political figures and commercial interests, this is expected to remain a source of tension for the foreseeable future. While this may result in further violence between security forces backed by different factions, its effects will largely be political. However, this effect could seriously hinder the development of Somalia’s permanent constitution, the advancement of negotiations between the federal states and the central government, and the political progress necessary to make Somalia a viable state. Given the impact on security and Somalia’s internal regional dynamics, it is likely that Mogadishu will pursue negotiations with the UAE to resolve their differences and restore relations. However, Qatar and Turkey likely view this as an opportunity to increase their involvement in the Horn of Africa and undermine their rivals. Qatar and Turkey have likewise sought to gain a foothold in the country in the past several years, with Turkey being one of the country’s largest donors and investors and Qatar securing its influence by funding Somali politicians, including President Farmajo. This underlines the position that Somalia is in due to its weak governance and reliance on foreign aid, vulnerable to the aims and goals of the international community, whether that is Western development and military intervention or competition between the Gulf rivals over their expanding influence in the region. With the UAE remaining interested in Somalia despite recent events and Turkey and Qatar expected to increase their presence, it will be difficult for Mogadishu to maintain its officially neutral stance on the Gulf crisis. 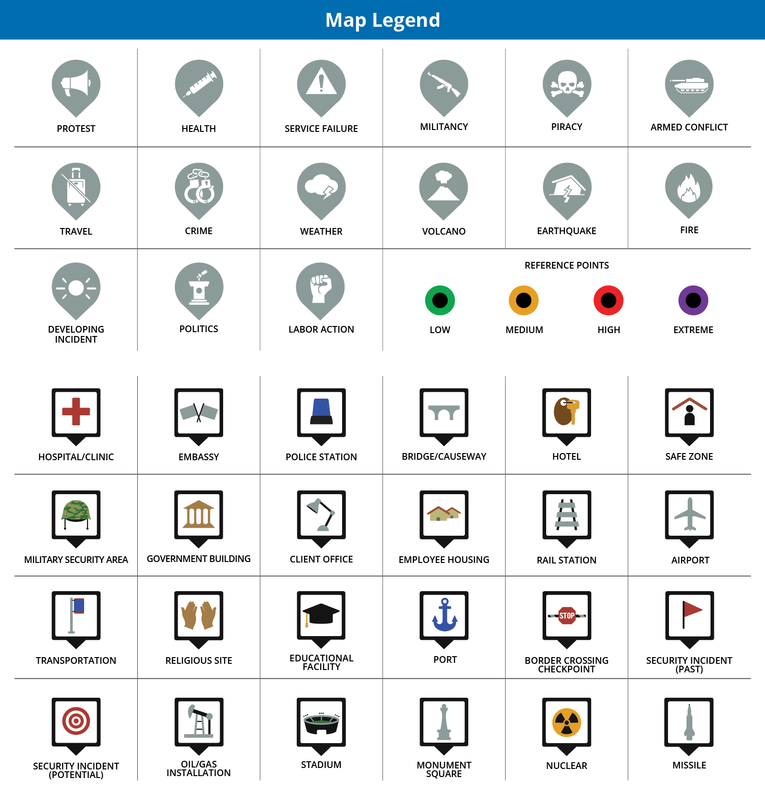 FORECAST: Given Somalia’s dependence on these countries to fund and operate not only military training but critical infrastructure and services, including airports, seaports, and hospitals, they will likely continue to maintain this balancing act. However, the federal government will likely face growing diplomatic and economic pressure to choose a side, though it will also have to contend with internal pressure by its constituent states who will disagree. In this regard, even if Mogadishu continues to lean toward Qatar, the nature of Somalia’s weak federalism will mean that different regions and states will continue to maintain their own foreign policies and relations with either side of the Gulf rivalry. If travel to southern Somalia is unavoidable, we advise remaining in the confines of Mogadishu’s Aden Adde International Airport complex. Hey Buddy!, I found this information for you: "test". Here is the website link: https://www.max-security.com/security-blog/tetstetete/. Thank you.